Your gutters do much more than you may give them credit for – they direct water away from your roof, they prevent water damage from occurring inside along your ceiling and walls, and they help safeguard the foundation of your home from pooling water. Without them, your home could easily be impacted by water leaks and wood rot that could lead to mold and many other costly problems. That’s why it’s important to de-leaf your gutters and remove debris that clog it up and prevent proper drainage. If you’ve never cleaned your gutters before or if you’ve missed a few routine inspections, let us help you get back on track with this easy guide to de-leafing your gutters. You wouldn’t skip out on your routine car inspections, so why would you opt out of your roof and gutter inspections? Your home is your most valuable asset, so it’s important that you schedule routine gutter checks and maintenance throughout the year. Every spring, summer, and fall you should have them cleaned out and inspected. This also includes checking the downspouts and cleaning any debris there as well. When de-leafing your gutters, first, put on heavy work gloves to ensure you’re safeguarded from handling any sharp objects. Then get a bucket and attach it to the ladder with a wire hook. Climb the ladder safely with another person holding it on the ground and use the garden trowel to remove any loose leaves and debris found in the gutter. Always be careful and cautious to avoid any low hanging wires when climbing the ladder. Once the loose debris has been removed, you can use a hose to wash away the remaining leaves and mud. If you own a pressure washer, you may also consider using this, but just be careful not to damage the shingles or other roofing and gutter materials. When flushing the gutters, spray the water towards the downspout and check for any clogs or standing water that may occur. If the water is not draining properly, attempt to remove clogs in a high-pressure setting or use a plumbing snake. You’ll also want to look for any damage like corrosion, loose parts, holes or fractured caulking along the seams. If the caulking needs replacing, you should first remove any old caulking and let the area dry before re-sealing any seams with new materials. New sealing will ensure that water does not seep behind the gutters, rotting away at your boards. If you spot rust and holes, it’s time to call a roofing specialist to discuss replacement options. The weight of debris can pull gutter spikes from the rafter causing the gutters to sag and damage the rivets that hold multiple gutter sections together. If this is the case, you’ll want to replace the gutter spikes and refasten the rivets with a rivet gun to ensure the gutters are performing optimally. Gutter guards are used to help keep the debris out of your gutters. Installing a guard can also help reduce the number of times you need to clean your gutters. When it comes to purchasing guards, there are several types of gutter guards on the market, so talk to a professional who can help guide you in finding the best model for your roof. 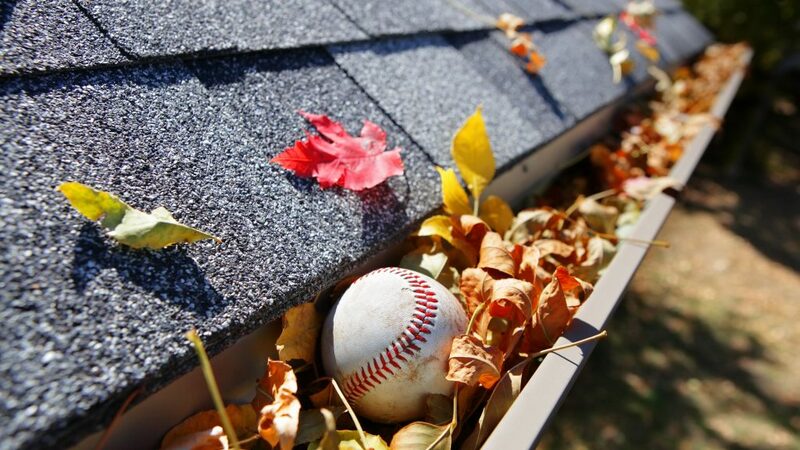 De-leafing your gutters is an important part of home maintenance. If you need advice or a professional to help take care of it for you, talk to us at Roofmaster. We offer a variety of roofing services to keep your home and roof protected.